See those three dots at the end of Top 10 Items… well that indicates that a dialog window will open. From that dialog change the default settings from 10 to 1 and choose your coloring. The image below shows the default setting an the setting after we have customized it. Now all we have to do is click OK and your formatting will be applied on the selected range. The highest value should now be colored. 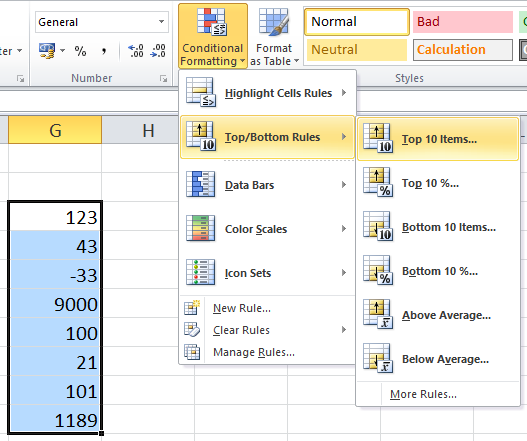 The great advantage of Conditional Formatting is that it is dynamic. So if a number changes and that becomes the highest number the appropriate cell will be colored and the previous one will be white again. 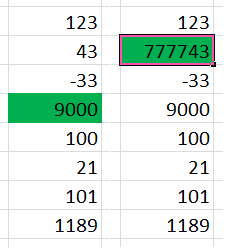 Now this is one way to do the Conditional Formatting for this question. You can also choose to add a new rule yourself. In that case choose New Rule… from the menu. You will see the next dialog pop up. Choose the third option from that dialog and apply the same settings (top 1 – color) and click OK.
That is all there is to it! Simple, effective and colorful. Homework: how to apply conditional formatting to the minimum value in a cell range? 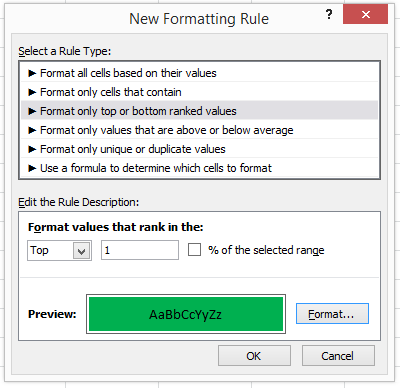 This entry was posted in Excel, Office Tips and Tricks and tagged cell range, Color Cells in Excel, Color Range, Conditional Formatting, Excel 2010, Excel 2013 on October 18, 2014 by Maurice.